John Lennon's Gypsy Sgt. 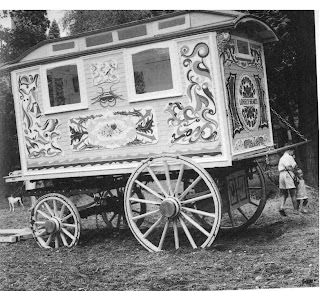 Pepper's Caravan is of the Burton design and is often called the Showman, but Burton is preferable as it differentiates it from the heavy coach-like showman’s wagons pulled bt several horses or an engine – ‘Showman Specials’, not classifiable as Gypsy caravans. Orton and Spooner at Burton-upon-Trent, Staffordshire, were especially noted for it, and excellent ones were built by Howcroft or Hartlepool, Durham, Watts or Bridgewater, Somerset, and others. It is straight-sided but with wheels under the body, which projects over them, affording maximum floor space. The walls may be either paneled or of rib-and-matchboard construction, like the Reading, but they never slope out more than two inches. The roof, which always has gutters and a skylight, sometimes of a Pullman kind, has a flatter arch than that of the Reading. The most ornate wagons are paneled front, back and sides, with elaborately carved oak plaques fixed to each panel. Though sometimes Gypsy-owned, this type was the one most favored by traveling showmen; unlike the Gypsies they kept to the high-roads, did not need high wheels to cross fords, and preferred the greater floor space.